Football, is a way of life in Britain. It’s sewn into the British tapestry of life. Saturday afternoon Football is as British as the Royal Family or Steak and Kidney pie. Put simply Football is a passion, a freedom, a family. In some quarters the hard-core fanatic is misunderstood, it is after all ‘only a game’. So to thrash around and scream like a lunatic, at your team’s fortunes, may seem like madness to the uninitiated or indeed to those who have no interest in the beautiful game. There is a dark underbelly to this game we love so much. The hard-core fanatic takes on a whole new meaning and the idea of family is a violent, tightly bound brotherhood of thugs and street toughs. Given the title, I’m sure you have figured out what I’m referring to here. Football ‘Hooligans’ or ‘Casuals’ as they prefer to be known these days. 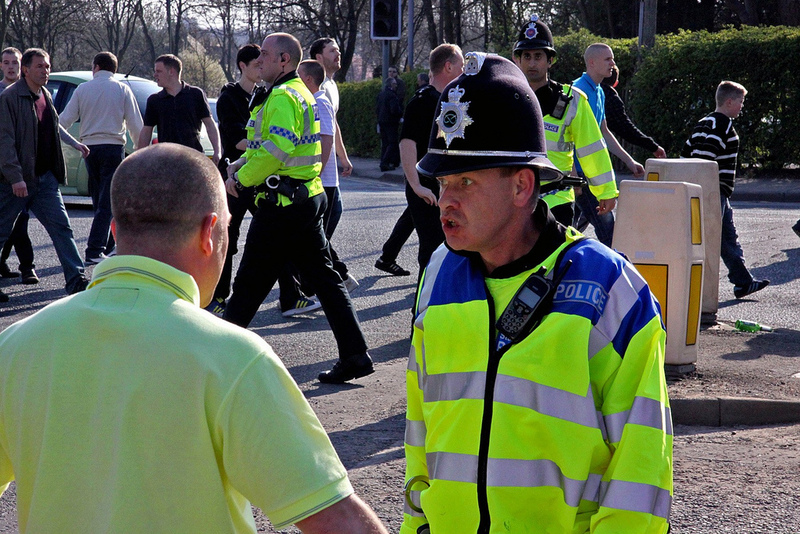 Football hooligans is one of the largest and most time consuming problems the police have to face. Hooliganism became prevalent during the 1970’s. Infamous firms such as the Birmingham Zulus, Leicester City’s Baby Squad and West Ham’s Inter City Firm, began to emerge. Over the next two decades, there were thousands of instances of Football related violence. The foul sight of blood was all too common a scene over a football weekend. During the 1980’s there were three noteworthy instances of Football hooliganism that were covered extensively by the main stream media. But the most shocking of these three, was the 1985 Heysel disaster. Liverpool and Juventus, were battling out for top honours during the European cup final, in the Heysel stadium in Brussels. The stadium itself, was in a bad way, crumbling and literally coming away at the seams. The two sets of fans were separated by a fence, and a “neutral zone”, which was populated by mostly Juventus fans. In an attempt to escape the oncoming threat of a large portion of Red Clad Liverpool fans scaling the fence. 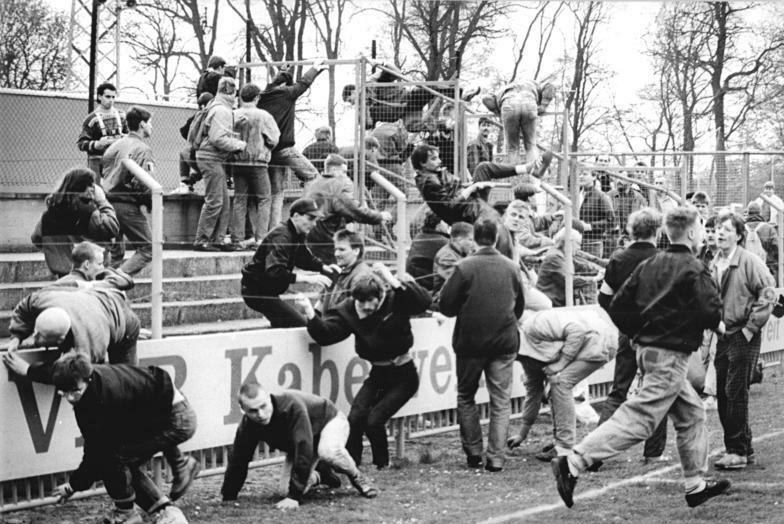 The Juve fans, ran across the terraces and towards a concrete wall, many of which were crushed to death and many more were badly injured, when the wall buckled. 39 fans lost their lives and estimates claim 600 more were injured. The footage of the disaster shows hordes of fans, throwing, bottles, bricks and brandishing weapons like children’s toys in a playground. The police are simply overpowered, they can only look on and watch as the place is literally crumbling around them. The reaction to this ugly incident was the banning of all English clubs from European competition for “an indeterminate period of time”. The ban was overturned 5 years later for all clubs but Liverpool, who were given an additional year. Imagine that, two of the world’s biggest teams, bringing a hue of pure darkness, blacker than anything seen before or since, over what should have been a joyous occasion for all. The reaction to the Hillsborough disaster which blamed the blameless, was more than likely a descendant of Heysel, someone needed to be blamed. The Majority suffered the Minority. The Legacy endures. The banning of the English’s teams seems as though it was more of a gesture to the rest of Europe than an actual solution to the growing pandemic. The government, tried a new approach to their domestic problems. 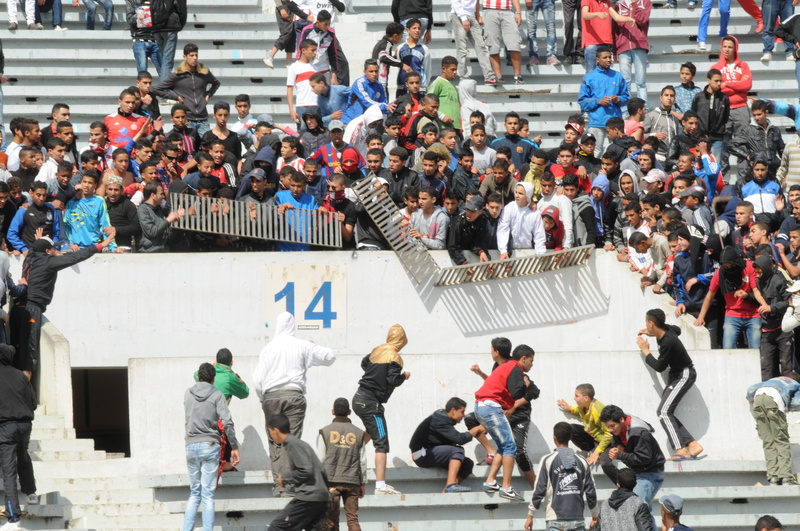 They began separating the fans and issuing three month stadium bans. This once again is a fine gesture, but this did not solve the problem of violence before and after games. Given the policing and technology in the 1980’s, the police would have had a damn hard time, keeping out the banned protagonists from the previous punch up, anyway. Since the 1980’s technology has moved on, CCTV has come into place more prominently and banning orders include a certain mileage of restraint near the stadium. We are led to believe the numbers are tumbling and it’s rare we hear of a full scale riot happening in the streets, after football. But from what I can see the numbers aren’t all that different. According to the Home Office figures for the 2012/13 season there were 2,462 arrests for violence and public order offences. There were 2,452 banning orders imposed for unruly fans. However according to figures released by the University of Leicester for the season 1986/87, the number of arrests were at a figure of 5,502. These figures however are perhaps slightly unreliable due to the lack of sophisticated banning orders, and it would not therefore be unreasonable to suggest repeat offenders over this period. Adding the banning orders together with arrests for violence and public order offences, comes to 4,914. And a figure of 5,502 for all football related arrests during the late 80’s when violence was apparently at its worst and the figures are beginning to look slightly ominous. In fact throughout the rest of the late 80s’ and the 90’s and the arrest level rarely goes over 6,000, as per the University of Leicester’s figures. The times have changed, technology has moved on. Those with banning orders, more often than not stay clear of the games, under threat of a prison sentence. However the Firms have moved along with the times themselves. Technology benefits all. The casuals, organise fights between rival firms, via social media and mobile phones. They are faster, smarter and more savvy, if the police were to arrest all of the peoples involved in these violent clashes then the figures would be sky high, but the simply reality is that this is not possible. On a personal note, I could probably understand if these people were fighting for the pride of the team they follow, perhaps there is some twisted morality behind that, like in the old days. But it now seems it is no longer about the teams, it is about the thrill of the chase and the adrenalin, bass pumping possibility, that there will be an exchange of fists and the intense thought that one may get a bottle smashed upside the head, by the end of the night. The overall feeling is that these thugs, feel as if this way of life, is fun and a good laugh, but let’s inspect this more closely, shall we? Meet Subject A: John, he’s a Manchester United Fan. Meet Subject B: Tim, he’s a Manchester City Fan. Now subject A and subject B, are almost friends, they have arranged to meet up after the football on Saturday Night, and they’re bringing a group of friends along for the ride. Decked out in their traditional attire, of tracksuits/hoody’s and trainers etc. After 6 or 7 beers, they are ready for a night on the town. The groups meet in a quiet part of Manchester, which won’t be quiet for long, they spot each other and at full pelt run at each other like Mediaeval knights! Thugs and Mugs of the Night. The air is scattered with flying bottles and bricks, some even hit their intended targets. Which in turn spews dark red patches of blood over the targets new Fila Trackies. Bummer. Through the haze of fists and flying legs, John spots Tim through the crowd. John runs at Tim and lands a sweet right hook, cracking Tim’s jaw. Now John is pleased with this clean contact. However Tim stubbles backward and cracks his skull on the pavement. John is now slightly less pleased at the prospect of the mangled, bloody head, which resembles something more like an octopus at this point, staring back at him from the gutter. Should justice prevail the next thing John will be looking at is the Judge, who will send him down for man slaughter. Oh why, oh why, did John ever get mixed up in this craziness? This is of course slightly subjective, but my gut tells me that this has happened before, and unfortunately it is bound to happen again. Sure, like any average football fan, I cheer when we win and I wallow when we lose. I don’t take to the streets, with my best punching arm cocked like a shotgun, ready to frantically land blow after blow on suckers from a rival gang of people who support a different club. Perhaps the notion is lost on me I don’t know? But the said truth still remains, as long as there is a difference of opinion in this world, violence will often follow. Winning, they say, is everything.